We all know that fitness is a big part of feeling well. I’m always trying to keep on top of staying healthy and maintaining a healthy weight. I especially focus on doing cardio and if I’m going to put all that work in I want to make sure that I have a scale that is accurate and helpful. I focused on smart scales which help you to track your progress through iPhone and Android phone apps. Smart scales can track your weight for you without having to type or having to use a pen and paper. Many of the best smart bathroom scales are compatible with the most popular fitness tracking apps. After you pair your scale to Wi-Fi or Bluetooth you can use just one app or multiple apps to see the information from the scale. Some of the scales also include a heart rate monitor. Another advantage to these scales is that even if you don’t care about tracking your weight for yourself you may need to send that information to your doctor. These scales make that an easy thing to do and save you a lot of time. Some of the best scales also measure body fat, and some measure water percentage and even bone density. To top that off some of these scales measure your heart rate through your feet and others have an add on handle for the purpose. For those of you who really don’t want a fancy smart scale I’ve included my top picks for low cost digital run of the mill bathroom scales. they are accurate and that is the most important thing. What Bathroom Scale is best for me? That really depends on whether or not you want a smart scale to track your progress for you and to save you time. If you’re only interested in getting an accurate reading and don’t mind tracking by yourself, then a normal inexpensive digital scale should do the job. Pros: Amazing design. Long battery life (rechargeable). Syncs via bluthooth and Wi-Fi. Available in black or white. Cons: Pricey. No pregnancy mode. Not recommended for people that have pacemakers. The Nokia Body Cardio is a sophisticated top of the line smart scale. Its an exceptional device and well deserves the title of #1 Winner. It syncs with the Nokia Health Mate app. I’m really impressed with the sleek design which has a tempered glass top. It really looks and feels like state-of-the-art. A smartphone is required to setup the scale the first time and it also works with the Withings Health Mate app. The scale can be used by multiple family members and each person needs to enter in some details about their body for the scale to work properly. Every weight in automatically syncs with your phone making tracking a breeze. A neat bonus is that the scale shows the weather. The scale also reads your heart rate through your feet. It features a Pulse Wave Velocity sensor to estimate your arterial health but this reading can be inconsistent and I’ve heard the are removing that feature due to regulatory issues. The scale uses a mild electrical current passed through one foot and the other to measure fat, muscle, and water content. If you have a pacemaker its not recommended that you use this scale! 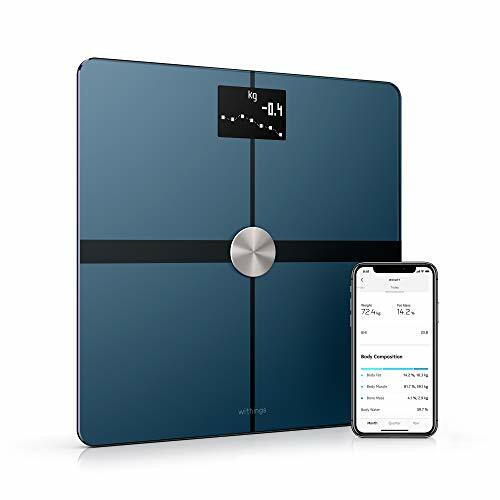 If you want a top of the line super sleek and fast scale that measures your weight, bmi, bone mass, body fat, and heart rate this is the scale for you. Pros: Accommodates unlimited amount of users. Great looking design. Wi-Fi and Bluetooth. Available in black or white. Cons: Shape causes it to be a bit unstable. Not recommended for people that have pacemakers. 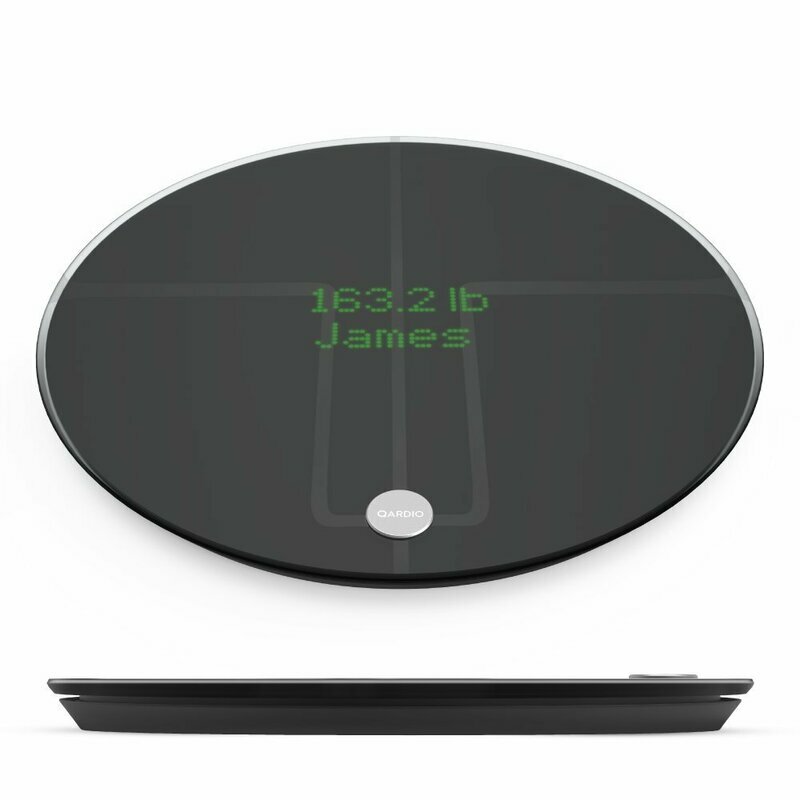 The QardioBase Smart Scale is another high-end state-of-the-art bathroom scale. I really like the design of this scale although it would probably be a little more stable if it was more square. For this reason its my pick for #2 Winner. Its definitely cool to look at. This bathroom scale logs your weigh in’s automatically and tracks your progress through an app. It can also be used in conjunction with the QardioArm blood pressure cuff. I really like that the app has a pregnancy mode. The scale works with the free Qardio mobile app and its available for both android and iPhone users. 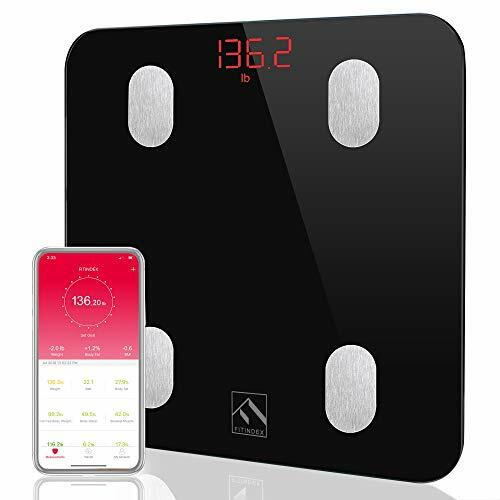 This scale measures, weight, water content, body fat, and body mass index along with muscle percentage and bone content. The scale uses a mild electrical current passed through one foot and the other to measure fat, muscle, and water content. If you have a pacemaker its not recommended that you use this scale! The scale uses Wifi to update your measurements when your phone is out of bluetooth range. You can also setup notifications through the Cardio app to remind you to weigh yourself. This is an amazing scale! Pros: Nice design. Unlimited amount of users. Available in black or white. Reasonably priced. Cons: Pricy. Not designed for pregnant women and not recommended for people that have pacemakers. The Yunmai Premium smart scale is a well designed impressive scale. It can measure and track up to an impressive 10 parameters. The parameters inlclude: Basal metabolic rate, body age, body fat, body mass index, bone mass, water level, weight etc. If you have a pacemaker its not recommended that you use this scale! Its my pick for #3 Winner because you get lots of functionality but its relatively expensive. When you first get the smart scale you need to set it up using an app on your phone. A great bonus is that you can sync the app with GoogleFit on android and MyFitnessPal and Apple Health on iOS. What really sets this smart scale apart is what you get for the money. Its the #1 winner for Best Value because it gives you many of the readings/functions of high end smart scales at a medium price point. This is a great buy! Pros: Integrates with other FitBit apps and products. Excellent design. Very Fast. Available in black or white. Cons: Sensitive (you need to watch your position). Body fat measurements aren’t always accurate. Doesn’t work with socks on. Not recommended for people that have pacemakers. The FitBit Aria 2 is one kickass scale. If you use other FitBit apps and products this is the scale for you because it integrates with them. All of your information from the scale is synced via Wi-Fi with your FitBit account. This gives you a much better picture of your progress. Compared with the Aria 1 there have been major improvements to the accuracy of the scale. I really like that you can have personalized greetings and icons. The scale will also show you your BMI (body mass index). The scale will also measure your boy fat percentage but this measurement tends to be inaccurate. The scale also only works if you take your socks off. Like other scales that measure body fat a small current is sent through your feet. If you have a pacemaker its not recommended that you use this scale. The scale will store information for up to 8 users which should be more than enough for most families. Overall with the exception of the body fat estimates the scale is very very accurate. 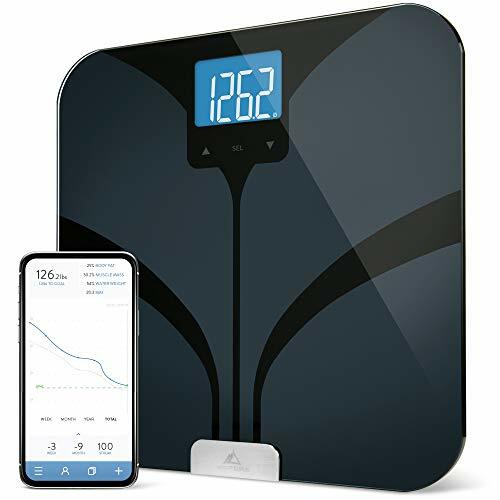 This is the best scale overall for keeping track of your health and progress but if you don’t use Fitbit’s other products you may not need this smart scale. For FitBit users this is a great addition to your health tech and the most logical smart scale purchase. Its my pick for #1 Winner simpy because it works with fitness trackers. Have a look at my article on fitness trackers you can grab a Fitbit tracker that’s compatible with this scale. Pros: Great sleek design. Comes in black and white. Has Wi-Fi and bluetooth. Easy to use. Captures many data parameters. Cons: Heart rate doesn’t show on the scale itself only on the app. Not suitable for people with pacemakers. 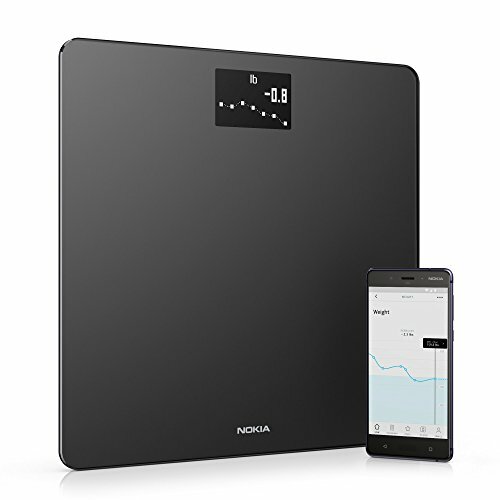 The Nokia Body + Smart Scale is a well designed affordable scale. It gives you a lot of bang for the buck. 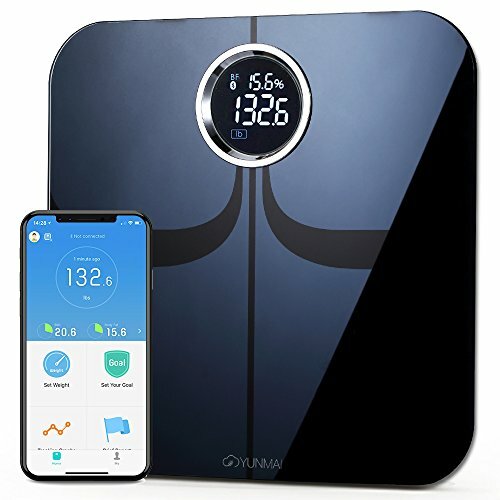 It connects to the Health Mate app and measures: weight, heart rate (measured through phone flash- not the scale itself),fat mass, body water content, bone mass, and muscle mass. It also measures your BMI. If you have a pacemaker its not recommended that you use this scale. I really like that it also shows you todays weather. The app will also show you how many steps you’ve taken today if you have a smart watch or fitness tracker. The Health Mate app syncs with over 100 other fitness and weight tracking apps. The scale can also be used to measure the weight of your baby. Its my pick for #2 Winner becasue some people have said its BMI measurements are innacurate. Pros: Nice design. Bluetooth. Large display. Automatic shut-off. Cons: No Wi-Fi. Not for people with pacemakers. The Easy @ Home Smart scale is an excellent scale for the price. It offers a lot of the functions of more expensive scales at a much lower price. It is equipped with bluetooth technology alone and no Wi-Fi. This means that it can only transmit the information to the app on the smartphone if the phone is within bluetooth range. The smart scales LCD display is large and easy to read but only displays the weight. For the other metrics you’ll need your smartphone and the app. This scale can measure your weight, body fat, visceral fat, body water content level, bone mass, BMI and more. Thats alot of functions for a great low price. If you have a pacemaker its not recommended that you use this scale. On the downside there have been complaints the app being disappointing. there have also been complaints about weight accuracy. Its also lacking Wi-Fi and for those reasons is my pick for #3 Winner. Pros: Good customer support. Stylish design. Affordable. Has Wi-Fi. Cons: A bit heavy. App doesn’t track calories. Not for people that have pacemakers. 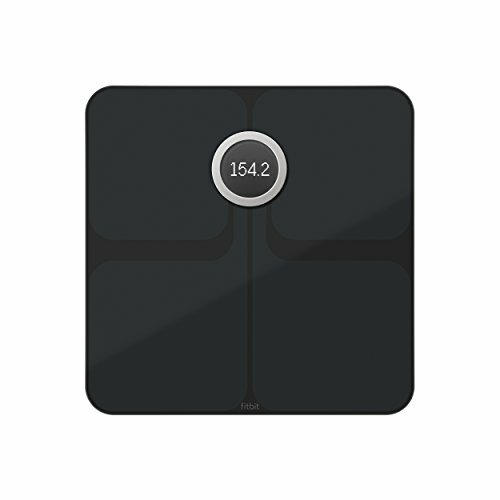 The Weight Gurus Smart scale is an excellent weight loss and tracking tool. It has a nice modern sleek design. It offers many of the features of more expensive high end scales at a great affordable price. For that reason it earns my pick as #1 Winner. It can be used to measure weight, BMI, water content weight, bone mass, and muscle mass. You can also have up to 8 users for this scale which should be more than enough for most families. The scale automatically transfers the data to your app via Wi-Fi, and the phone doesn’t need to be near the scale. Thats a great feature in and of itself for this price point. It comes with a free app that lets you track your progress. The app uses charts and graphs so you can easily see how you are doing. This scale gives very accurate weight readings. If you have a pacemaker its not recommended that you use this scale. This is a great purchase overall! Cons: No app or smartphone connection. Not for use by people that have pacemakers. The Omron Body Coposition Monitor and Scale is a very interesting product. It differs from all the other scales in this report. Its designed so that you stand on it and hold the handles and monitors with your hand. This is a product that is serious about gathering your body metrics. It also comes in at an affordable price. Unfortunately it does not connect to your smartphone or a tracking app and instead stores a 90 day history inside it. The Omron has six different sensors and captures accurately your: body weight, body fat, BMI, Muscle, resting metabolism, body age, and resting metabolism. It supports up to 4 different users. The Omron takes measurements from your feet and your hands and that increases its accuracy If you have a pacemaker its not recommended that you use this scale. Overall this is a great device if you need to know the parameters it measures precisely. Its my pick for #2 Winner because you may not need the precision body composition information, and may prefer a regular scale design. Pros: Excellent sleek design. Accurate. Wi-Fi and Bluetooth connectivity. Comes in black or white finish. Cons: App is a bit messy. No metrics for heart rate or detailed body composition. 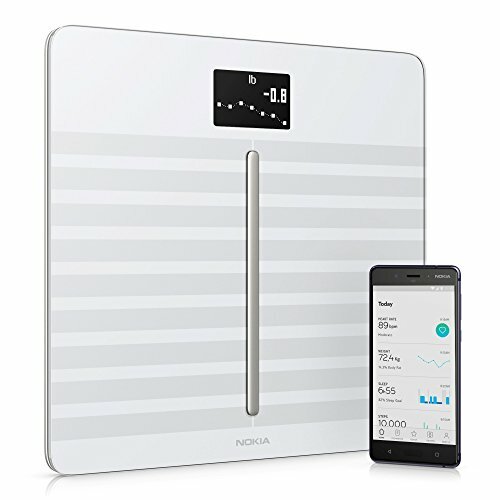 The Nokia body is an excellent well designed simple smart scale. Its very reasonably priced. The scale allows for up to 8 users. 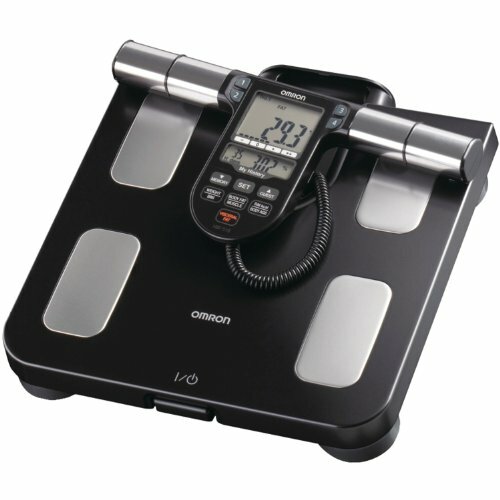 It has bluetooth which is a huge bonus for a scale at this price. The Wi-Fi connectivity allows the data to be transferred without the need for your phone to be in bluetooth range. Its compatible with many fitness and health apps including MyFitnessPal. It also connects with the app that it comes with: Health Mate. Some people have complained about the way the app is organized and for that reason its my pick for #3 Winner. The scale measures your weight and your BMI but doesn’t measure the other metrics like the more expensive smart scales do. Thats not a problem really because you might not even be interested in the other metrics. Your weight progress is tracked through the app and you can also see the weather on the scale. 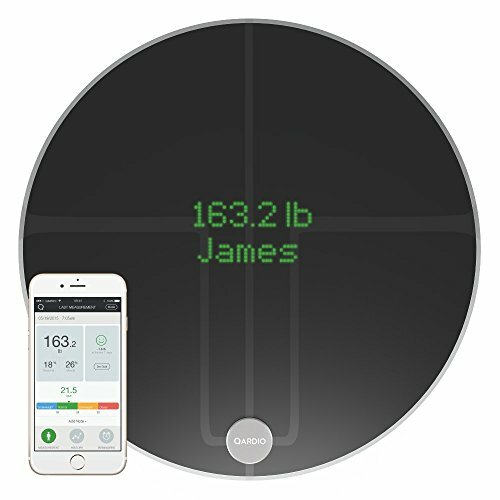 This is a great smart scale and for a great price! 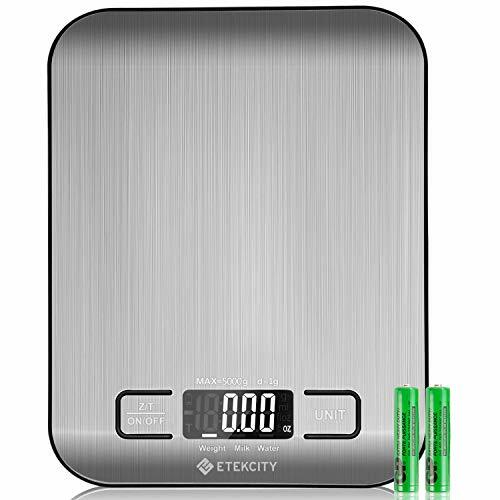 The Etekcity is a great simple non-smart bathroom scale. Its nicely designed and has an impressive high accuracy. For that reason its deserving of the title of #1 Winner. It achieves this level of accuracy by using 4 precision sensors. Its equipped with an auto-off function. Its also smudge resistant and easy to use. The LCD is large enough for you to easily read your weight. 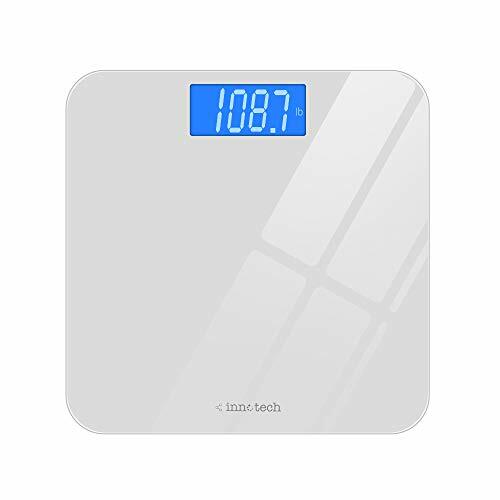 If you want to save money and don’t mind that you’ll need to manually track your weight, this is a great bathroom scale to buy. The Innotech Digital Bathroom Scale is another simple low cost option for measuring your weight. It has automatic calibration and an easy to read display. It has a really nice tempered glass shatter resistant finish. It is accurate to .2 lbs and uses 4 precision ensors. Its my #2 Winner because there have been some complaints about quality and loss of accuracy over time. Staying fit and staying committed to fitness and well-being will go a long way to helping to cope with anxiety. Having a smart scale can make the process more fun. Its also much more convenient because it automatically tracks your metrics. You can see the progress you’re making using graphs and charts on many apps, and this can help you stay motivated. Having an accurate scale is a great way to stay on top of the progress you’re making. If you don’t want to invest in a smart scale I’ve listed some inexpensive simple digital scales as well. I hope you enjoyed this report. Want to know more about Home Bathroom Scales and weight loss?